Weather and climate patterns are about to take another turn as one of the strongest El Niño's on record continues its decline, and now it looks as if its sister could take its place. NOAA forecasters announced Thursday the warm ocean waters known as El Niño are rapidly cooling, and if that continues over the next six months, we'll likely see La Niña conditions develop. So, they issued a La Niña watch. 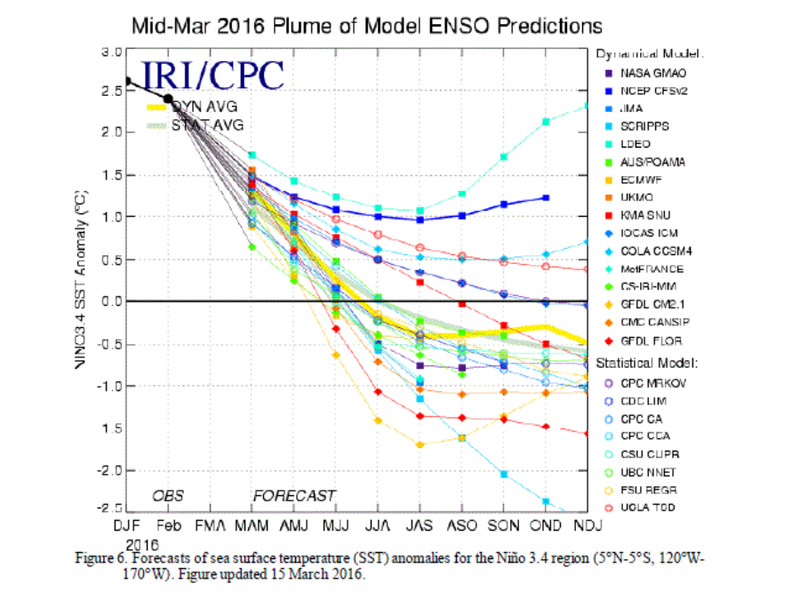 Nearly every forecast model is predicting a transition to neutral conditions by late spring or early summer, and most of those forecast models show a La Niña developing. La Niña is the opposite of El Niño, and they're both oceanic-atmospheric interactions altering weather patterns around the world. So what does this changing weather pattern mean for the United States? The first thing we'll likely notice is a busier hurricane season. That's not saying much compared to last year's exceptionally slow season, but La Niña years usually mean decreased wind shear in the Atlantic where hurricanes form. If you're rooting against the hurricanes, the upside is this La Niña won't show up until the tail end of the hurricane season, so we may not feel its full effects. After hurricane season, next winter is more likely to be a dry one across the southern half of the United States, which is bad news for places like California where residents are still dealing with exceptional drought conditions. And Texas, which just got out of a drought, could see those dry conditions returning. This past winter's mild temperatures will be a distant memory when places like the Midwest and the Northeast are more likely to see the return of colder winter conditions. In the meantime, scientists will spend the summer watching the east equatorial Pacific for the transition from El Niño to La Niña.